Tapestry by partner-chef Suvir Saran (formerly of Devi) is a very good Indian fusion restaurant. 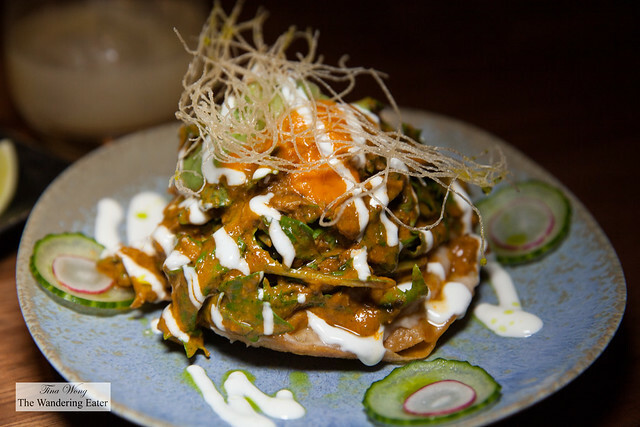 I know the word ‘fusion’ attached onto any cuisine tends to make stomachs turn sour but this was thoughtfully done and for the most part, executed very well. The underlying flavors are rooted in Indian cuisine but the menu goes global in terms of the actual dishes and cooking techniques like a Mexican taco (which the restaurant does an excellent version of and I’ll get to that soon). The restaurant is lovely with the large windows that faces Greenwich Street look like an upscale home furnishings store with white fluffy textiles and throws. 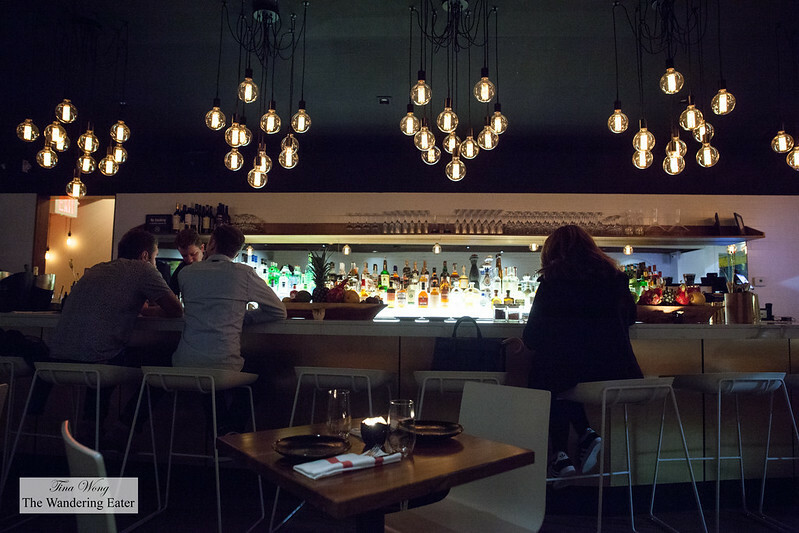 When you enter through the door, the it opens to a two dining areas – toward the front of the restaurant is a nicely spaced out bar/lounge with cool Edison light pendants above the bar while the back is cozier and a little dimly lit. Our drinks for the evening was the Southern Belle cocktail for me and my friend opted for pastis on the rocks with a splash of soda. My cocktail was interesting as it combined the fresh flavors of subtly sweet yellow pepper and cucumber infused tequila and it’s still had the refreshing notes from the fresh lime juice and cucumber. 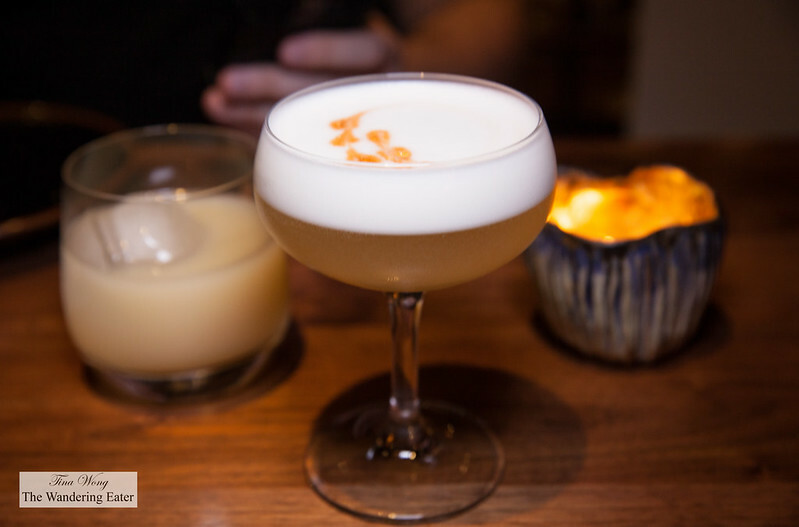 The creamy egg white foam added some heft and topped with drops of beet tincture. The earthy beet flavors slowly melds and sort of dominates the cocktail as the night goes on. The miniature loaf of warm, housemade truffle brioche on a swathe of truffled butter was so delicious that neither of us saved any bread. 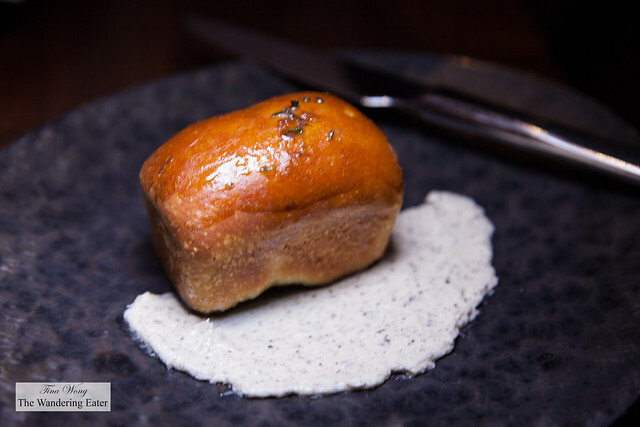 The soft, tender bread had both the intense aromas of black truffles as well as the inimitable, musky flavors. Our appetizers were generally the strongest portion of our meal. The Taco Casero is a take on the classic tacos al pastor and it’s excellent. Robust flavors all around from the beautifully seasoned and juicy pulled pork, gingery, spicy, cabbage slaw and the sweet, almost candied, grilled pineapple flavors. 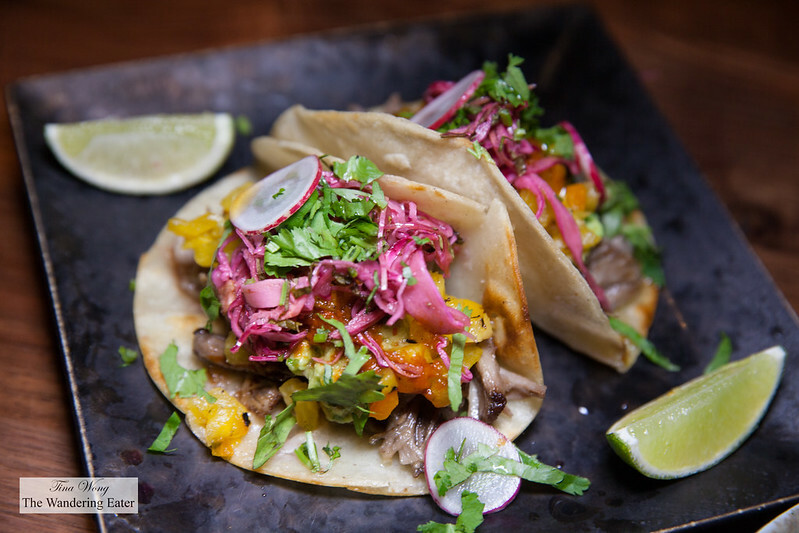 The pineapple was the most memorable part of this taco since most restaurants tend to be afraid of the pineapple’s flavors and we adored how every flavor stuck out. The rabbit mole tostada was generously topped with the pulled rabbit and mizuna with a heavy coating of pepper chutney, salsa verde, cacao, yuzu-cilantro-yogurt crema. The flavors here were bold as well. I was surprised how much mizuna was in here and it’s greatly appreciated to add that breath of freshness to this relatively heavy dish. 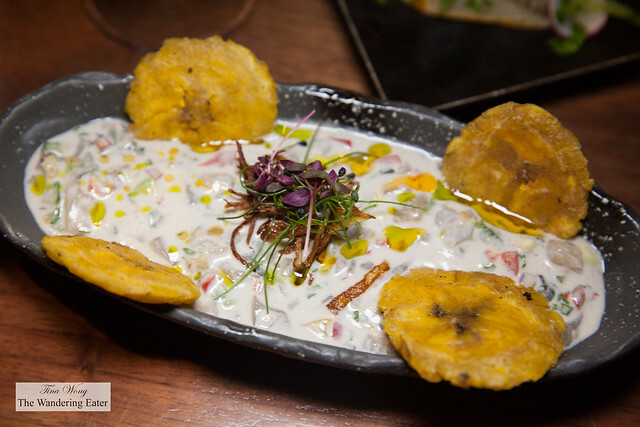 The tiger’s milk ceviche has both the Indian and Peruvian aspects of what a ceviche is. 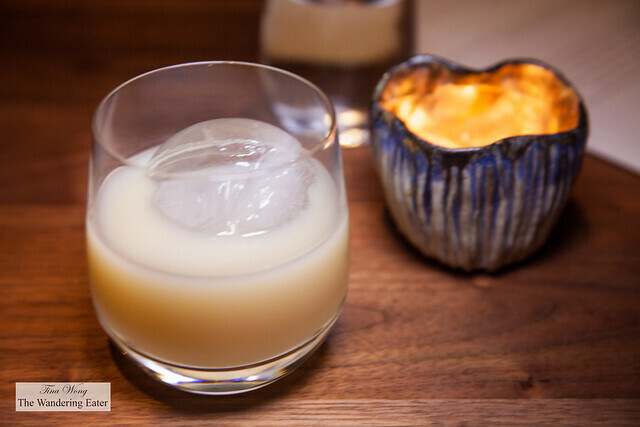 Tiger’s milk tend to be much lighter since it’s the light marinading liquid that remains from making ceviche (usually fresh lime juice, cilantro and spicy aji amarillo) except this kitchen added the coconut milk making it much more richer. The scallops were tasty but we find it chopped a little to fine for us to appreciate the scallop. The slices of fried plantains were fine but we preferred to have it fried to a crispier texture. The crispy okra salad was everything I ever wanted in a fried okra dish. The okra was sliced into small wedges and fried that it retained the wonderful crispiness. The leeks were thinly sliced and deep fried giving it a gentle, caramelized onion flavor. The fresh, fine slices of red onion and cilantro added some zest and freshness. 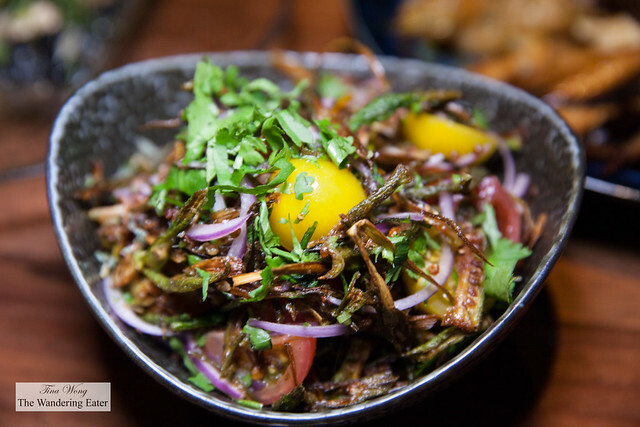 The chaat masala was a wonderful dressing to bridged everything together and added sweet and spicy notes. It’s wonderful. 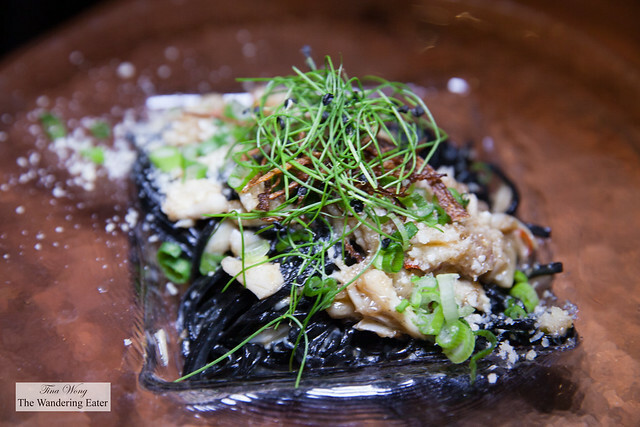 The main dishes of angry crab, inked noodles, garlic, Thai basil & hot chiles, crispy bits, herbs, and Parmigiano sounded like an interesting mix of Asian and Italian. Everything was cooked nicely and it was spicy but what annoyed us was that odd sugary sweetness that lingered on the background. (It felt like it’s an extra teaspoon too much sugar to balance the spiciness of the chilies.) Frankly, I was hoping the kitchen be uninhibited with the spice levels like they were for the appetizers and I’d be happy. The short ribs topped with cashew-poppy kurma, parsnip-cheese puree, roasted baby carrots (purple and regular), parsnips, and cipollini was a good dish. We really liked how fork tender this meat was cooked and the kurma sauce was sweet and delicately spiced and nutty. The roasted vegetables were caramelized that it sweetened up the overall dish. 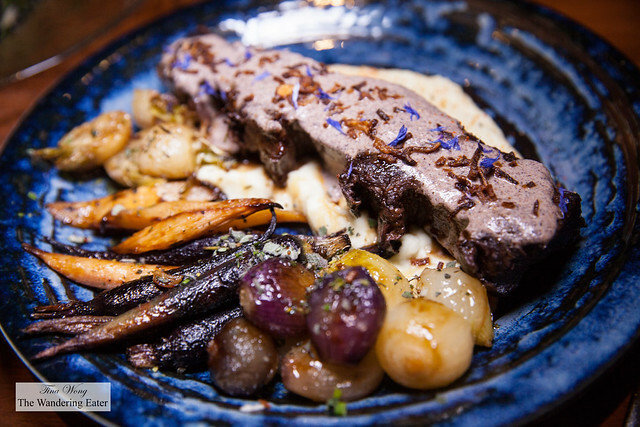 The parsnip-cheese puree works with the dish bridging the sweet and savory. 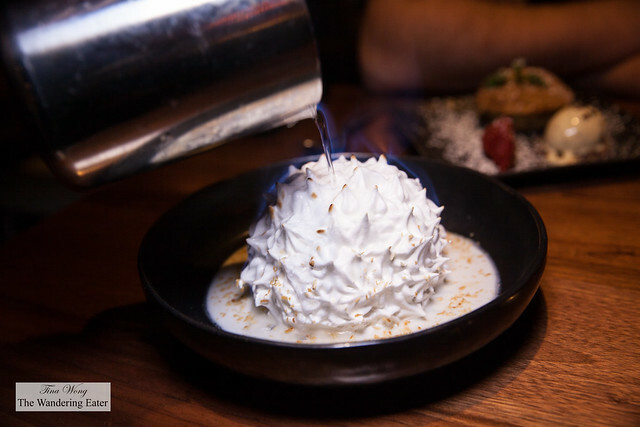 The Fire & Ice dessert is their take on the classic Baked Alaska. A layer of yellow cake topped with a layer passion fruit and guava ice creams and covered in meringue. Table side, our waiter will light up some rum and pour the flaming spirit on top of the dessert to gently toasting the meringue for a short period of time. 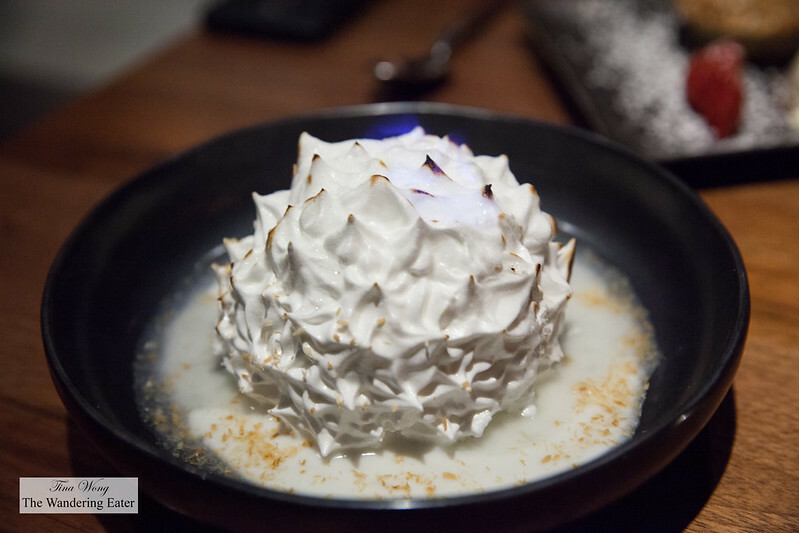 The baked Alaska was very good and I adore the tropical fruit ice creams as they were creamy and had a potent flavor of the said fruits. My friend had the Winter Celebration Tart that reminds me of the British classic dessert, mincemeat pie. 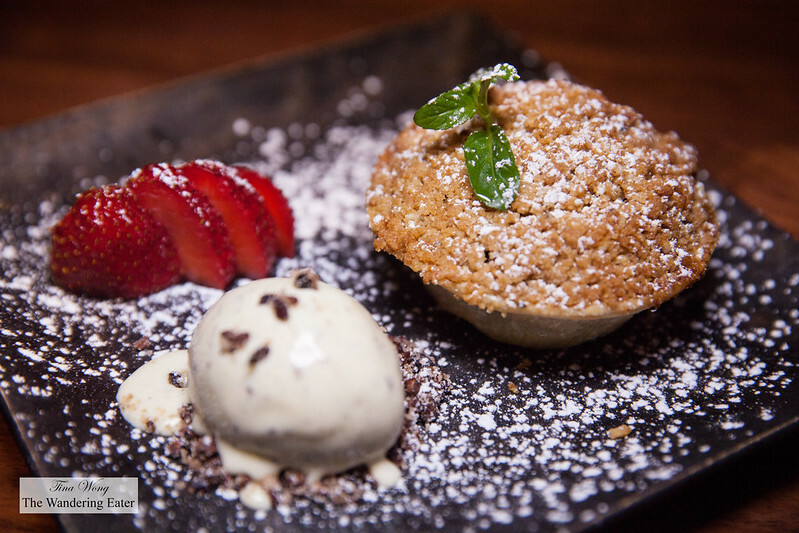 The tart is loaded with lots of sweet, gently spiced dried fruits and apples and the tart shell was nicely crisp and buttery. 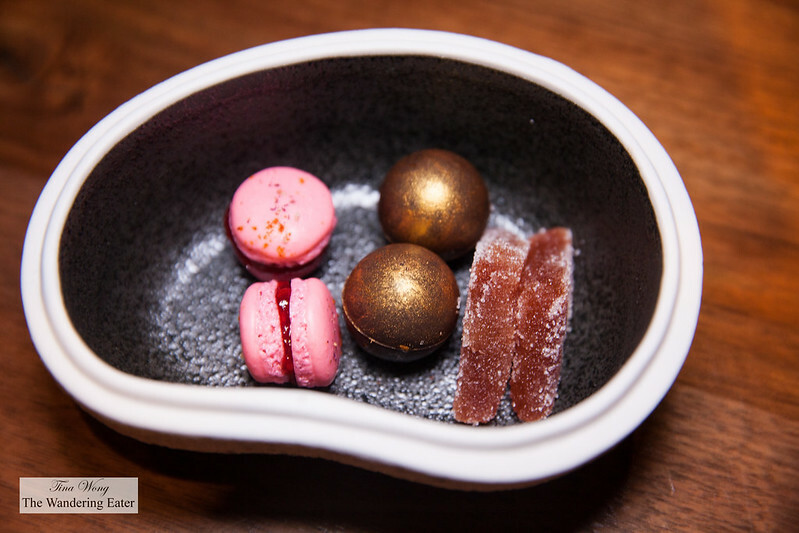 There are housemade petit fours served at the very end of the meal. When we’re there, our assortment were twee rosewater macarons that has a very nice flavor of rosewater without tasting like perfume. The dark chocolate bonbon filled with cherry liqueur was simple and delicious as it’s stated. The slices of soft guava pâte de fruit was sweet and had a sugary crust to add some texture. Lovely little bowl of sweets. Overall, this restaurant is very creative and generally pulled off the Indian fusion that works very well. Service was great and accommodating.